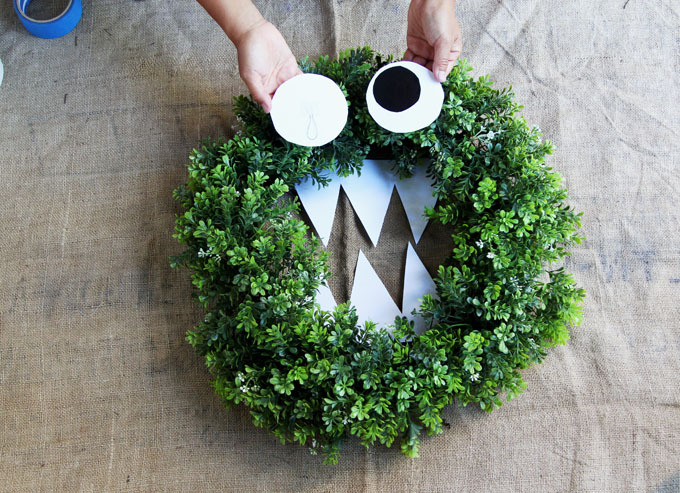 This super easy DIY monster Halloween wreath is inspired by the Cookie Monster and other friendly, sweet, fun-loving little monsters out there! 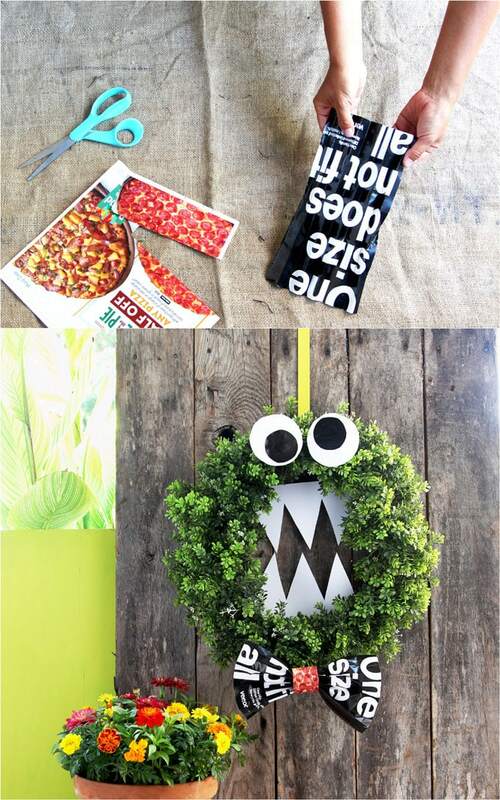 Made with simple materials like recycled magazine paper and card stock, this monster Halloween wreath is a great kids Halloween craft and great looking DIY Halloween decoration! 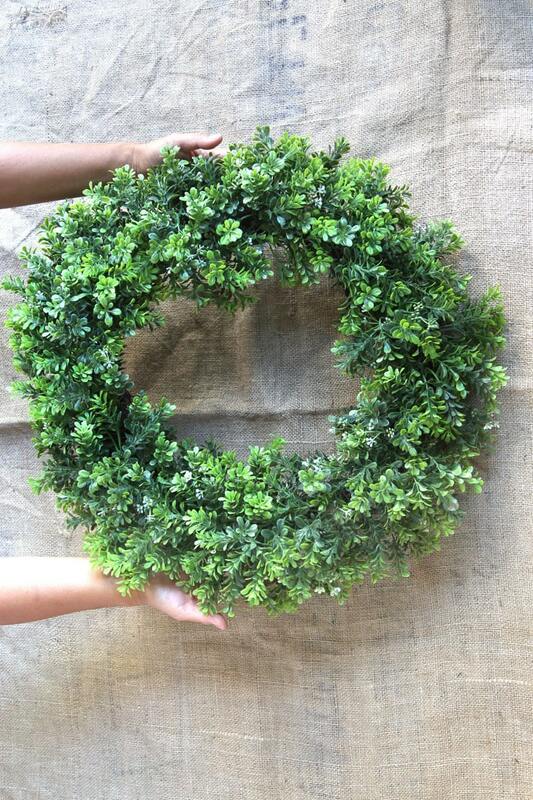 Although the artificial boxwood wreath isn’t free initially, it will be a base for so many fun DIY wreaths through the seasons from spring through Christmas! 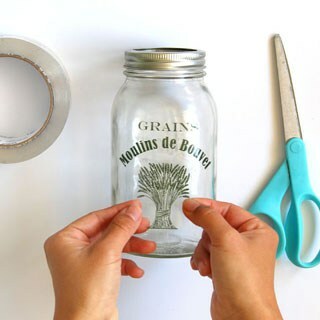 In that sense, it is like a vase or a backdrop for all the new creations. Flying witch DIY Halloween wreath, tutorial here. 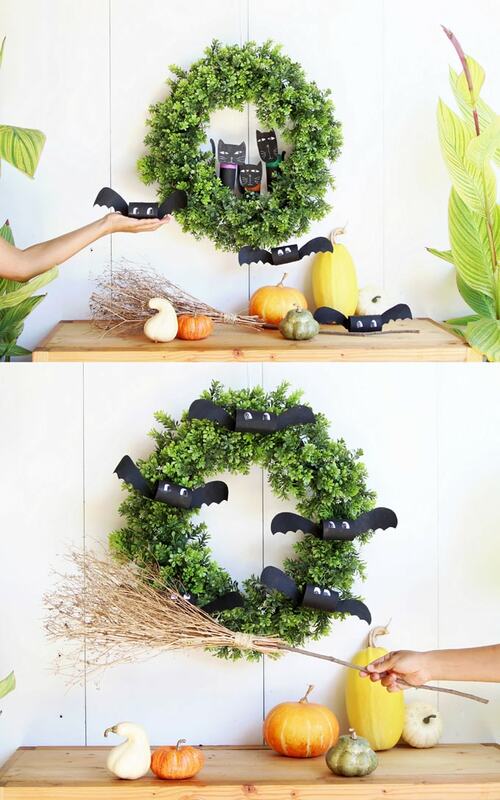 Halloween bat wreath, tutorial here. Halloween cat wreath, tutorial here. 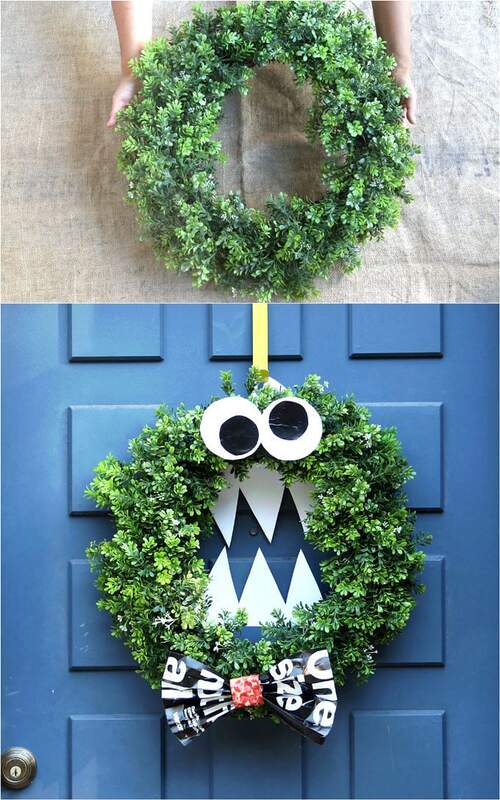 Now let’s make our DIY cookie monster Halloween wreath! 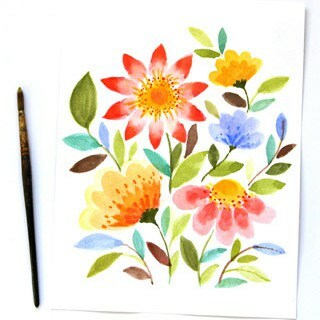 white card stock like this one, it is great for all kinds of paper crafts! Cut two circles from the white card stock, each measures about 3 to 4 inches depending on the artificial boxwood wreath size. Glue the black circle onto the white circle. Now we have two eyes! To make the teeth, fold a piece of 8.5″ x11″ white card stock in half on the 11″ length, draw the teeth shape and cut, so you have the upper and lower teeth. 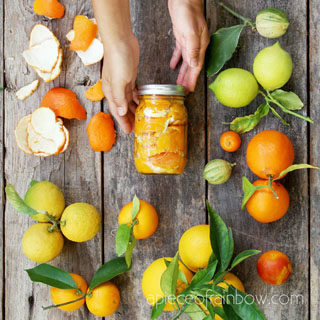 Tape a piece of strings or twine to the back of the teeth, and tie the strings to the back of the wreath. I like using duct tape, because it is stronger. I also taped the corners of the teeth to the wreath to hold everything in place. 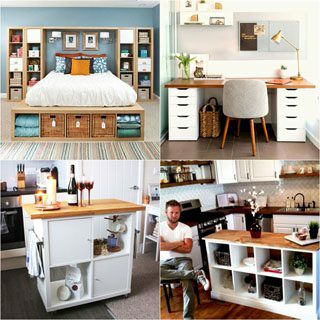 See above photo. Make a loop with a piece of string and tape it to the back of the eye. 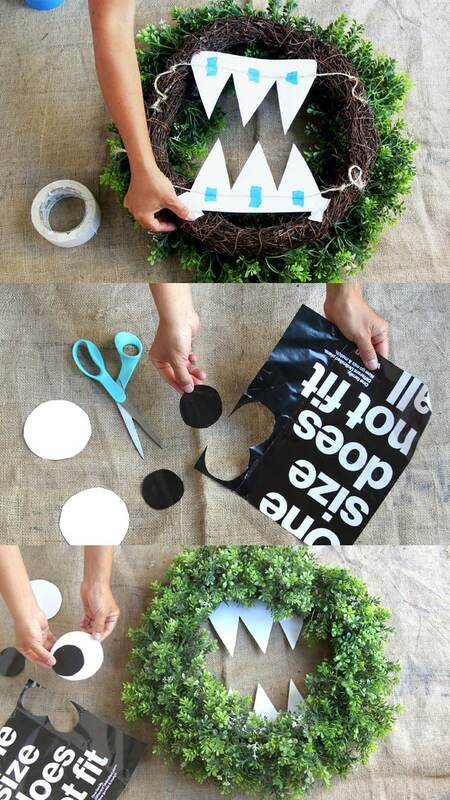 This will make it very easy to hang or tie each eye on the foliage of the wreath. Now the SUPER fun part! This little monster has big teeth, but he really is a kind and fun-loving monster, which is why he needs a stylish bow tie! I wanted the bow tie to have black, white, and red in them. Luckily, I found all the colors on some magazine pages and ads in the mail! The pepperoni pizza photo was totally unplanned yet PERFECT! 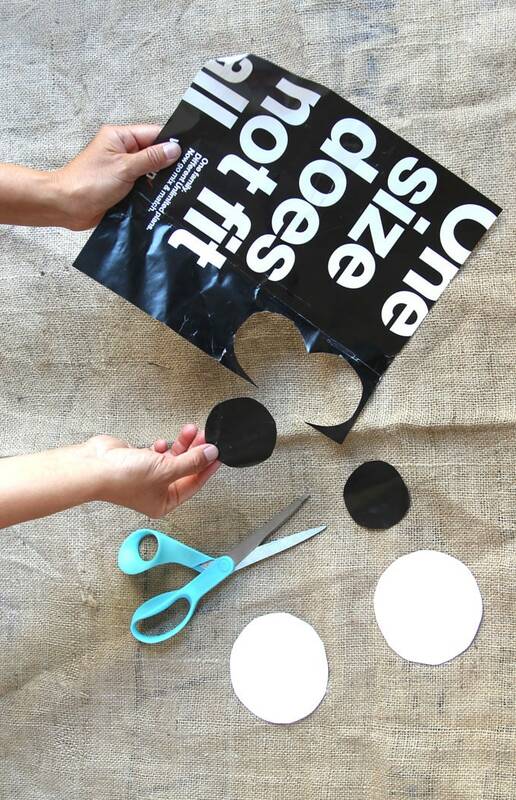 Make accordion folds on the black and white magazine paper. 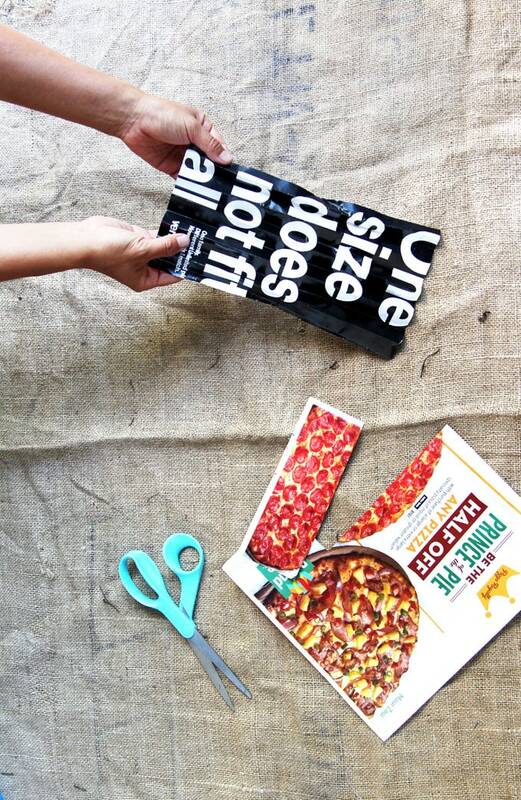 Wrap the red pizza photo into a ring and use tape or glue to secure. 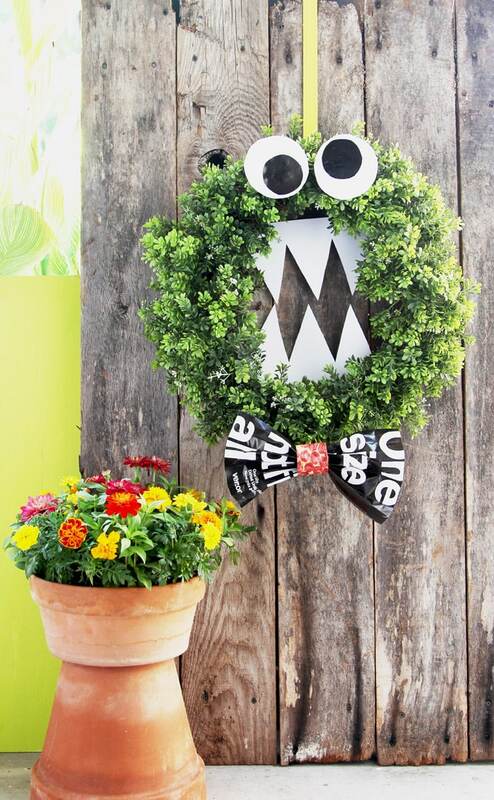 Add a piece of string like on the back of the eyes and hang the bow tie onto the monster Halloween wreath. Isn’t he stylish and handsome with his pizza bow tie?!? 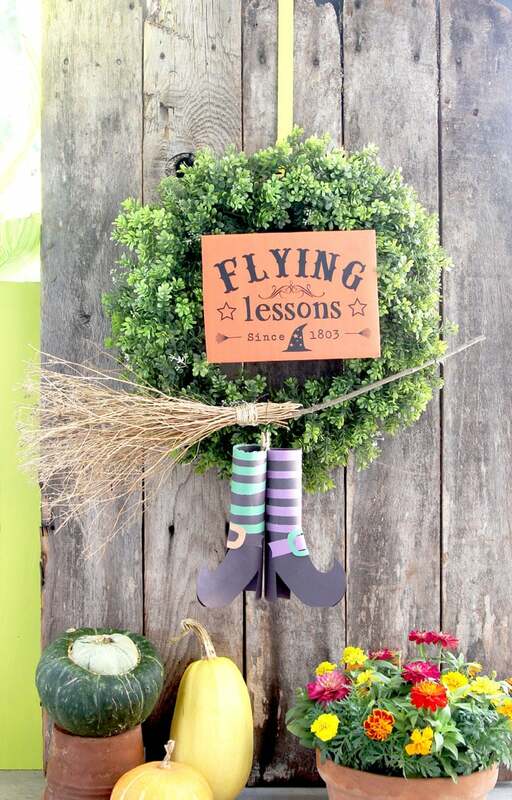 Another fun and easy wreath made from the same boxwood wreath is our flying witch DIY Halloween wreath! 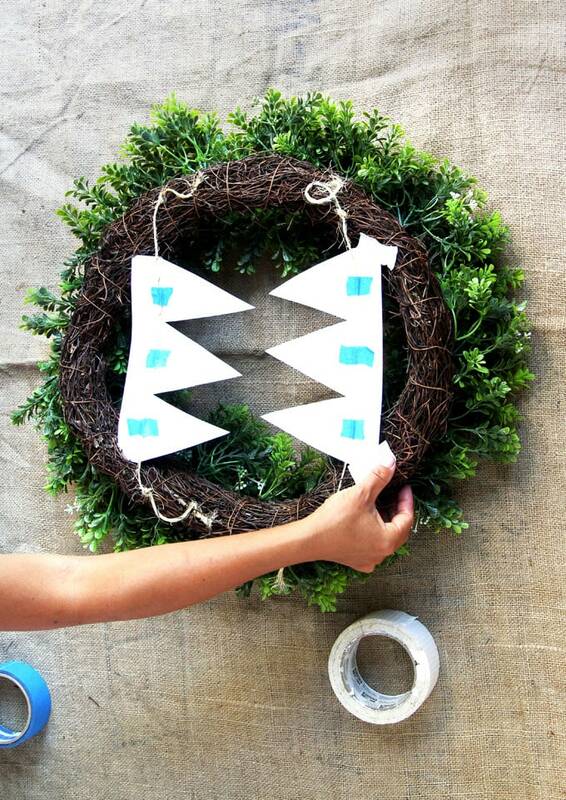 All three elements in the wreath above is a DIY. You can probably tell I was carried away this year with too much Halloween fun! DIY Halloween Cat Decorations with Free Template. 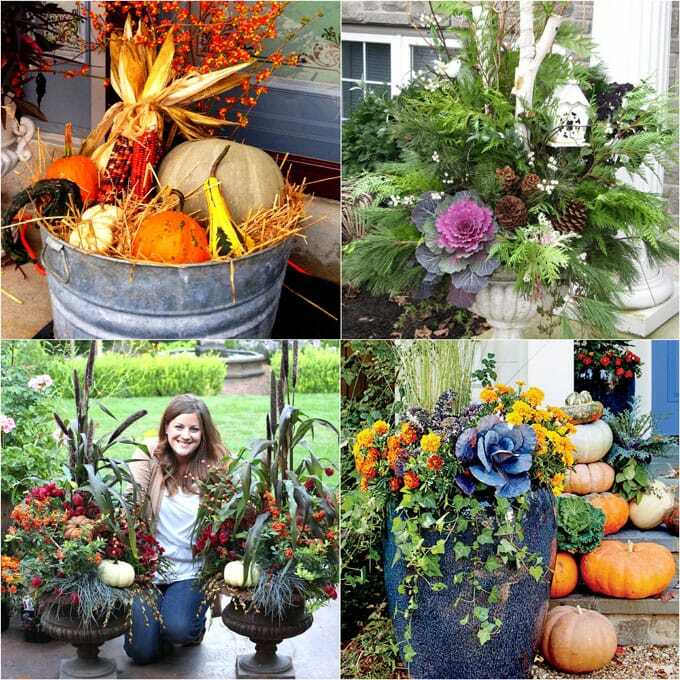 Before we say goodbye today, here are some non-Halloween fun for you: 22 stunning fall plantersfor easy outdoor fall decorations! Love your economical wreathe idea! I have used interesting magazine pictures to punch out shapes with papercrafting punches instead of buying expensive embellishments!